Motivated by guests who care about the environment, carbon footprinting and being good custodians of the earth, hotels have long been leading the way when it comes to doing things that are green and ecologically sensitive. The Royal York Hotel in Toronto, for example was one of the first to plant their roof with edibles and put bee hives up there to pollinate the plants, making hundreds of pounds of honey in the process. 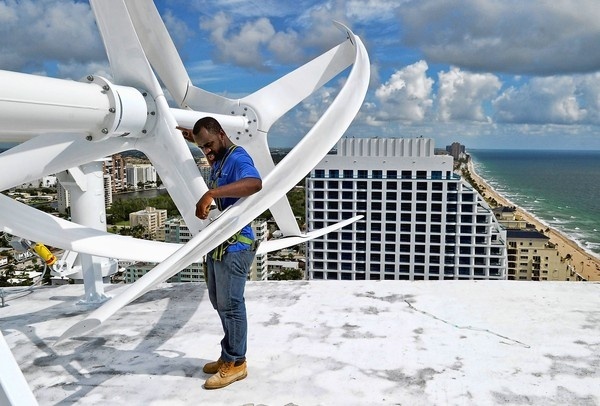 Now the Hilton Hotel on Fort Lauderdale Beach in Florida has invested more than $500,000 to install six wind turbines, powered by the natural breezes blowing from the Atlantic Ocean. The use of wind turbines as a source of renewable energy is still rare in the lodging industry, but is increasingly becoming a viable option for lodging establishments, according to Green Lodging News. "The technology has improved with innovation in design, and costs are coming down," said Glenn Hasek, editor and publisher of the Ohio-based industry publication. Hilton's turbines are expected to produce 24,000 kilowatt hours of energy and to reduce its electric bill by as much as 10 percent. Because guests care about such things, we think the hotel should promote this to guests and offer tours to show how the system works.